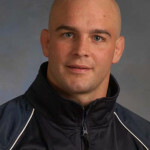 Jody Strittmatter won two NCAA Division II national championships at Pitt-Johnstown. Jody Strittmatter works a move on an opponent. Won two national championships at the NCAA Division II level for the University of Pittsburgh at Johnstown. Finished his college career with two All-American performances at the University of Iowa, one of the top programs in the history of NCAA Division I wrestling. 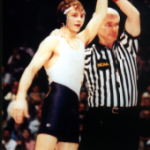 Cambria Heights High School graduate and former Pennsylvania state champion, Strittmatter won national titles at 118 pounds as a UPJ freshman in 1998 and at 125 pounds as a sophomore. A leader on the 1998-99 Mountain Cats squad that won the national team title. At Iowa, placed third at Division I nationals as a junior when Iowa won the team title. Was an NCAA Division I runner-up as a senior in 2001. Compiled an incredible 150-8 record, going 87-3 at UPJ and 63-5 at Iowa. He had 64 career pins. Inducted into the Pennsylvania Wrestling Coaches Association Hall of Fame Class of 2010. Inducted into Pitt-Johnstown Athletics Hall of Fame Class of 2011. Inducted into the NCAA Division II Wrestling Hall of Fame Class of 2014.